Need a new bikini, but don’t want to spend a ton of money? Here are five great bikini ideas under $25 each! Flaunt your style in this summer’s hottest trends, from mesh to floral to polka dots -- all without breaking the bank. Who would’ve thought mesh would look good on a bikini? Hollywood’s biggest stars, like Rihanna, have been seen in mesh bikinis this summer. Forever21 sells this black mesh bikini. Wear it, and make a bold statement! Bright, multi-colored animal prints are very “in” this summer. Wal-Mart carries this bright colored leopard print bikini. Show your wild side at the pool or beach with this number. Polka dots are a classic pattern that will never go out of style. Victoria’s Secret managed to combine polka dots and ruffles to make this the perfect bikini to bring out your girly side. Nautical patterns are this summer’s latest rage. If you want to cover up your stomach, but still want to show off some skin, wear this one-piece from Target. The ruffles on top also make this bikini very flirty. 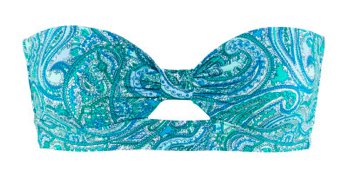 If you want to try something different, wear this strapless bikini from H&M. It is shaped like a bow, giving you the perfect amount of coverage while still showing a little skin with a small hole in the middle. Adding a bikini to your summer wardrobe becomes a whole lot easier when you don’t have to break the bank. Now that you know superb suits priced under $25 do exist, it’s time to get your shop on!